Gaelynn Lea tomorrow releases her third album ‘Learning How To Stay’. The album is her boldest and most expansive work to date which sees Lea focus on delivering a positive message. Simon Tucker reviews. The opening of ‘Learning How To Stay’, the third album by Gaelynn Lea, points crystal clear to the journey we are about to embark on. Slow paced piano, strings and drone take their positions in the stands slowly warming up and settling in before Lea herself places her beautiful voice on top as she starts to sing. ‘Bound By A Thread’ is a gorgeous opener to an album that unfurls at a wonderful pace invoking imagery as vivid as Springsteen and as instrumentally rich as a Bad Seeds record. ‘Learning How To Stay’ is traditional in feel but current in tone, managing to tap into many traditional forms of song-craft from the Middle East to the Midwest thus creating an album that touches all corners of the globe yet remaining at its core an American album in the classic sense. Lea’s violin playing flutters and floats always entering the frame at the exact moment it should and thus stealing the show. Songs like ‘The Last Three Feet’ and ‘Grace and a Tender Hand’ are swinging like a slow waltz yet pack such an emotional punch (thanks to both Gaelynn’s voice and the placing of her band who play faultlessly throughout) that they can leave you crying even as you are smiling. Whilst lyrically ‘Learning How To Stay’ has an obvious message of unity and togetherness, it is in the creation of the album and its final sound where we get a real sense of community. Aided by a Go Fund Me campaign, ‘Learning How To Stay’ features a slew of incredible musicians who all play their part in creating an album that is mystical yet direct, serene and unsettling. The musicians include Alan Sparhawk (Low / Retribution Gospel Choir) and Jeremy Ylvisaker (Alpha Consumer / The Cloak Ox) plus a whole host of others all there with the intention to create a work that will resonate with many and it is a goal they have achieved with remarkable effect. ‘Learning How To Stay’ is Gaelynn Lea’s finest moment to date and shows a true artist developing right in front of our eyes. It is an album that manages to carry the soil of the past, the sadness and toil and drag it into the now transforming all that has gone before into a path of future optimism. A remarkable album by a remarkable artist. 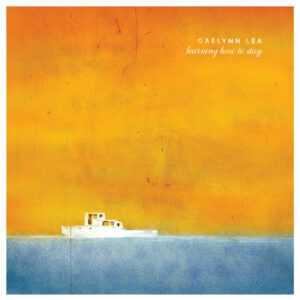 Gaelynn Lea can be found via her website, Bandcamp, Facebook and Twitter where she tweets as @GaelynnLea.